Objects are closely related to classes. We have already been working with classes for several chapters, and we have seen that a class can contain variables and subroutines. If an object is also a collection of variables and subroutines, how do they differ from classes? And why does it require a different type of thinking to understand and use them effectively? In the one section where we worked with objects rather than classes, Section 3.8, it didn't seem to make much difference: We just left the word "static" out of the subroutine definitions! I have said that classes "describe" objects, or more exactly that the non-static portions of classes describe objects. But it's probably not very clear what this means. The more usual terminology is to say that objects belong to classes, but this might not be much clearer. (There is a real shortage of English words to properly distinguish all the concepts involved. An object certainly doesn't "belong" to a class in the same way that a member variable "belongs" to a class.) From the point of view of programming, it is more exact to say that classes are used to create objects. A class is a kind of factory -- or blueprint -- for constructing objects. The non-static parts of the class specify, or describe, what variables and subroutines the objects will contain. This is part of the explanation of how objects differ from classes: Objects are created and destroyed as the program runs, and there can be many objects with the same structure, if they are created using the same class. In this case, there is no such variable as PlayerData.name or PlayerData.age, since name and age are not static members of PlayerData. So, there is nothing much in the class at all -- except the potential to create objects. But, it's a lot of potential, since it can be used to create any number of objects! Each object will have its own variables called name and age. There can be many "players" because we can make new objects to represent new players on demand. A program might use this class to store information about multiple players in a game. Each player has a name and an age. When a player joins the game, a new PlayerData object can be created to represent that player. If a player leaves the game, the PlayerData object that represents that player can be destroyed. A system of objects in the program is being used to dynamically model what is happening in the game. You can't do this with static variables! In Section 3.8, we worked with applets, which are objects. The reason they didn't seem to be any different from classes is because we were only working with one applet in each class that we looked at. But one class can be used to make many applets. Think of an applet that scrolls a message across a Web page. There could be several such applets on the same page, all created from the same class. If the scrolling message in the applet is stored in a non-static variable, then each applet will have its own variable, and each applet can show a different message. The situation is even clearer if you think about windows on the screen, which, like applets, are objects. As a program runs, many windows might be opened and closed, but all those windows can belong to the same class. Here again, we have a dynamic situation where multiple objects are created and destroyed as a program runs. An object that belongs to a class is said to be an instance of that class. The variables that the object contains are called instance variables. The subroutines that the object contains are called instance methods. (Recall that in the context of object-oriented programming, method is a synonym for "subroutine". From now on, since we are doing object-oriented programming, I will prefer the term "method.") For example, if the PlayerData class, as defined above, is used to create an object, then that object is an instance of the PlayerData class, and name and age are instance variables in the object. It is important to remember that the class of an object determines the types of the instance variables; however, the actual data is contained inside the individual objects, not the class. Thus, each object has its own set of data. An applet that scrolls a message across a Web page might include a subroutine named scroll(). Since the applet is an object, this subroutine is an instance method of the applet. The source code for the method is in the class that is used to create the applet. Still, it's better to think of the instance method as belonging to the object, not to the class. The non-static subroutines in the class merely specify the instance methods that every object created from the class will contain. The scroll() methods in two different applets do the same thing in the sense that they both scroll messages across the screen. But there is a real difference between the two scroll() methods. The messages that they scroll can be different. 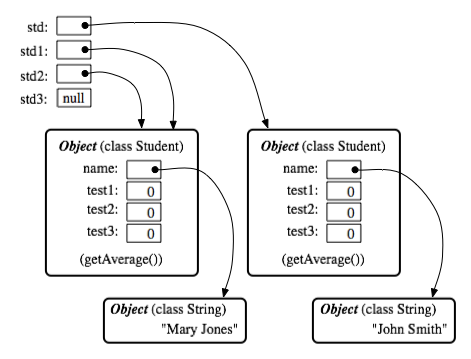 You might say that the method definition in the class specifies what type of behavior the objects will have, but the specific behavior can vary from object to object, depending on the values of their instance variables. As you can see, the static and the non-static portions of a class are very different things and serve very different purposes. Many classes contain only static members, or only non-static. However, it is possible to mix static and non-static members in a single class, and we'll see a few examples later in this chapter where it is reasonable to do so. You should distinguish between the source code for the class, and the class itself. The source code determines both the class and the objects that are created from that class. The "static" definitions in the source code specify the things that are part of the class itself, whereas the non-static definitions in the source code specify things that will become part of every instance object that is created from the class. By the way, static member variables and static member subroutines in a class are sometimes called class variables and class methods, since they belong to the class itself, rather than to instances of that class. would create a new object which is an instance of the class Student, and it would store a reference to that object in the variable std. The value of the variable is a reference, or pointer, to the object, not the object itself. It is not quite true, then, to say that the object is the "value of the variable std" (though sometimes it is hard to avoid using this terminology). It is certainly not at all true to say that the object is "stored in the variable std." The proper terminology is that "the variable std refers to or points to the object," and I will try to stick to that terminology as much as possible. You can test objects for equality and inequality using the operators == and !=, but here again, the semantics are different from what you are used to. When you make a test "if (std1 == std2)", you are testing whether the values stored in std1 and std2 are the same. But the values are references to objects, not objects. So, you are testing whether std1 and std2 refer to the same object, that is, whether they point to the same location in memory. This is fine, if its what you want to do. But sometimes, what you want to check is whether the instance variables in the objects have the same values. To do that, you would need to ask whether "std1.test1 == std2.test1 && std1.test2 == std2.test2 && std1.test3 == std2.test3 && std1.name.equals(std2.name)". changed by the subroutine,              changed, but stu.name is. that returns the value of title. By convention, the name of an accessor method for a variable is obtained by capitalizing the name of variable and adding "get" in front of the name. So, for the variable title, we get an accessor method named "get" + "Title", or getTitle(). Because of this naming convention, accessor methods are more often referred to as getter methods. A getter method provides "read access" to a variable. Even if you can't think of any extra chores to do in a getter or setter method, you might change your mind in the future when you redesign and improve your class. If you've used a getter and setter from the beginning, you can make the modification to your class without affecting any of the classes that use your class. The private member variable is not part of the public interface of your class; only the public getter and setter methods are, and you are free to change their implementations without changing the public interface of your class. If you haven't used get and set from the beginning, you'll have to contact everyone who uses your class and tell them, "Sorry guys, you'll have to track down every use that you've made of this variable and change your code to use my new get and set methods instead."